Just one year into the launch of BlackBerry 10, and users have shown themselves to be rather quick to upgrade to new versions of the OS. While the wireless carriers have interfered with BlackBerry’s ability to get out the newest versions of the operating system to everyone, even the United States seems to have gotten on-board with OS 10.2.1 so expectations are high for next month. While the day following the launch of 10.2.1 showed 66.61% of users on the newest OS, this came too late in the month to have much of an impact on the overall numbers for January. 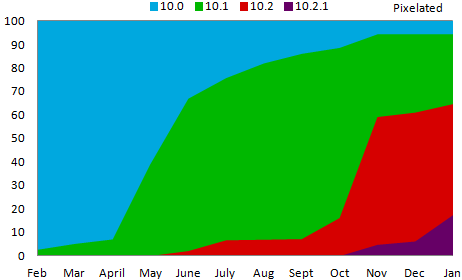 Growth of newer OS versions was overall steady, but slow. 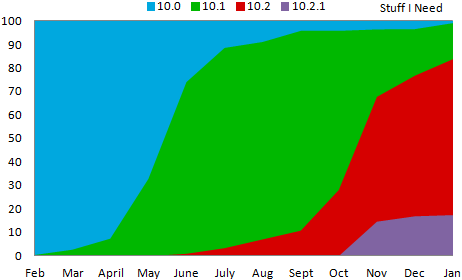 February is expected to be much better as there are now no carriers pretending that OS 10.1 is the newest release. This data was collected by BlackBerry World for downloads of the free strategy game Pixelated and the free checklist app Stuff I Need. Data shown on the chart is from the beginning of February 2013 through the end of January 2014.